Individuals suffering from locked-in syndrome are completely paralyzed and unable to speak but otherwise cognitively intact. Traditional assistive technology is ineffective for this population of users due to the physical nature of input devices. 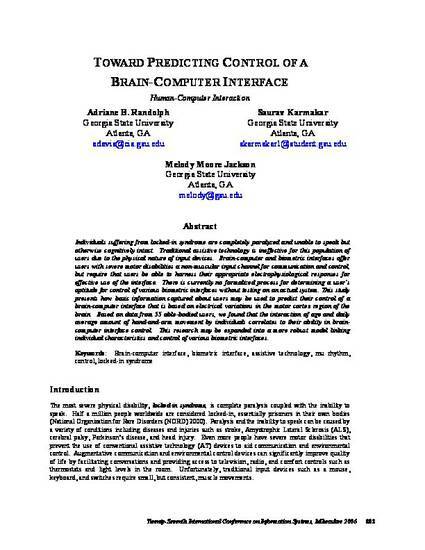 Brain-computer and biometric interfaces offer users with severe motor disabilities a non-muscular input channel for communication and control, but require that users be able to harness their appropriate electrophysiological responses for effective use of the interface. There is currently no formalized process for determining a user’s aptitude for control of various biometric interfaces without testing on an actual system. This study presents how basic information captured about users may be used to predict their control of a brain-computer interface that is based on electrical variations in the motor cortex region of the brain. Based on data from 55 able-bodied users, we found that the interaction of age and daily average amount of hand-and-arm movement by individuals correlates to their ability in brain- computer interface control. This research may be expanded into a more robust model linking individual characteristics and control of various biometric interfaces.